Kief adds whole new dimension — would we pull your legume? 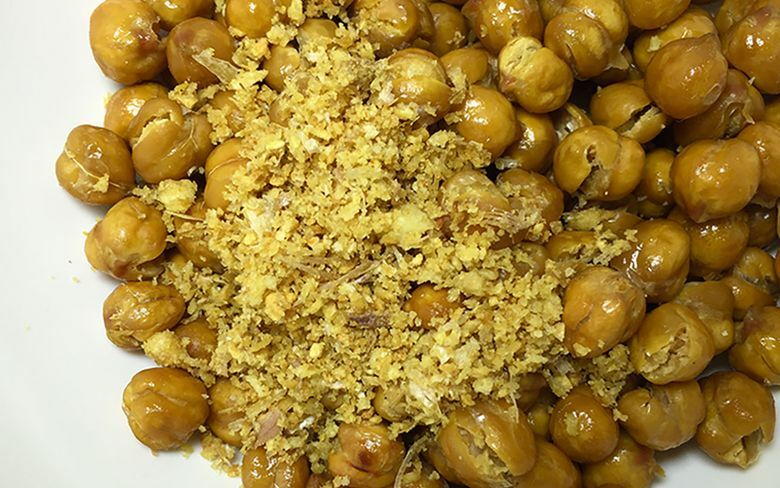 I ate a ton of chickpeas as a kid, but I never appreciated them as I do today. “Chi-chis” and macaroni, as it was served to me, was just a vessel for piles of caciocavallo or pecorino cheese. But I’d be lying if I understated how much the humble chickpea has grown on me, and mind you, that’s little thanks to hummus. To affirm the glory of the ceci (as they’re called in Italy), why not shake them up with some “special” spices and have them as the snack they were made to be? This was a munch of literature and lore, served up salty and plentiful by bars in Italy to encourage patrons to get thirsty — for more wine. Not a bad deal if you ask me. It goes rather well with the idea of cottonmouth, so cannabis is a great tweak on that concept. Heat oven to 250 degrees Fahrenheit. If you’re using dried beans, rinse and bring to a boil for one minute in salted water, then turn off heat and cover, soaking for one hour. Drain canned or soaked dried beans and rinse well. Line a bowl with some paper towels and pour over beans, allowing them to dry for a few minutes. Lightly oil a large baking sheet with olive oil. Add beans, then cover with some of the olive oil and salt and pepper. Roast for one hour until golden brown. Grind or chop dried garlic into a fine powder, mix with kief. Remove beans from oven, add to bowl with the remaining olive oil, then coat with the dried garlic and kief and mix well. Serve in 10 portions for a great grab and go item. When you turn humble beans into such a yummy and portable masterpiece, the mushy soup of the past becomes the crunchy wave of the future. With how affordable “chi-chi” beans are, you’re looking at under $2 for a massive portion, roughly $10 worth prepackaged in any deli, and that’s without medicine.